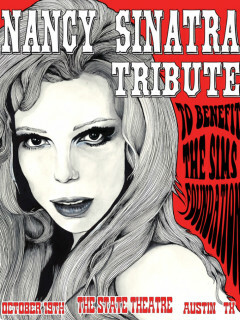 Five incredible voices will pay tribute to Nancy Sinatra, featuring Jazz Mills, Shelley King, BettySoo, Tameca Jones and Brennen Leigh with special guests Guy Forsyth, Corey Baum and Daniel James Leopold. The evening will be hosted by singer songwriter and KUTX DJ Elizabeth McQueen. Proceeds from the event will benefit the SIMS Foundation, an organization dedicated to providing mental health services for local musicians.